This is a redo from paper to digital - another one of those LOs where I got one paper one scrapped and got all the pieces cut to do the second LO and just never got the second one done. 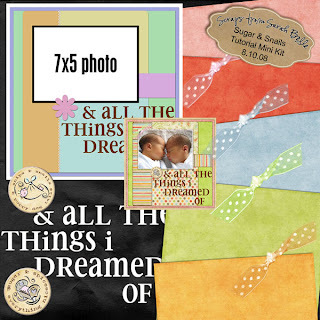 In addition to my MoM newsletter duties, I've also decided to try and teach some (so far 14 have joined our little group) of our mom's of multiples how to digital scrapbook. So this page is also serving as the first "lesson" of that process. I'm trying to lead the whole process on-line cause it's hard to get together without kids and with computers, but hopefully I'll be able to do some hands on stuff too. I was finally able to scan in some ribbons, extract them and have them keep their translucence (sp?). Not something I want to do a lot of, but I did want the ribbon to be similar to the ones that I had on the original LO. I won't be around much the rest of the month - we're close to halfway so it's time to start the newsletter and my internet browser keeps crashing every 5 minutes, so its not a lot of fun to be on-line and its practically impossible to get anything done. If I do have any spare time I'll be working on things for the OK, Just a Few Boys kit. thank you for sharing your hard won translucent ribbons, they are lovely and your photo is incredibly sweet! Sarah, this looks perfect! Love how you did one paper, one digital, and they look so similar. And thank you for the freebies!!! Can't wait to use it. :) You're the best. Good luck w/ the newsletter.